The violent break-up of Yugoslavia, like a long shadow, forecast what we are facing today: a Europe, tangled in a web of political and economic calculations, unable to stand up for its proclaimed values, leaving the space for extremist nationalist and right-wing forces to take action and implement their agenda. The following text is drawn from my memoir The Summer My Father Died, translated by George Szirtes, published recently by Telegram Books. The book talks about growing up in post-1956 Hungary, in a Communist family of Jewish origins. In those times in our part of the world politics was omnipresent in everyday life, even in the private sphere. Every turn of the tormented history of our region affected us personally. “My father’s death visibly began in the summer of 1992 at the outbreak of the first Yugoslavian war. It might not be a coincidence that the happy innocent childhood I was lucky enough to enjoy came to an end with my father’s death and the break-up of Yugoslavia. Until then, despite all warnings to the contrary, I believed that people were essentially good, that truth would eventually win out, that evil would meet the fate it deserved and that we were all immortal. I thought that while a moral universe founded on solid values might occasionally find itself in conflict with reality, such conflicts could always be resolved. I could, if I so desired, explain away my father’s illness and his inevitably approaching death, and that helped me to accept it. It was becoming cruelly apparent that the new world that was just then coming into being was not going to accommodate my father and his beliefs. Looking at it from the other side, I might have added that he had no strength left in him. He had had to survive a great deal in the past and there were ever fewer sources of power he could use to recharge himself. He was always so absorbed in the service of the Cause that he never learned that you could supplement your store of energy with something as simple as a book, an excursion or just enjoying the company of another person. But that other death that, two hours away from us, was wiping out entire families, streets, villages in such a hurry, that led old school friends, neighbors and former wedding guests to cutting each other’s throats in the name of some obscure issue of ethnic belonging – that I couldn’t understand. Or, to be more precise, I didn’t want to understand. In this I was just like my father who, when confronted with all the negative evidence about really existing socialism, hastily reviewed the accounts to find some excuse; and so I too refused to accept that the terrible scenes being played out before our terrified gaze by our country’s southern neighbors were in fact all true. I must have felt that if I accepted it, my entire world view – starting with my belief in the essential goodness of people through to my faith in the benign wisdom, or at least rational behavior, of democratically elected governments – was not valid. Then humanity was indeed the sowing of dragon’s teeth. Which, in retrospect, also meant that the gas chambers of the Second World War and the initial indifference of Western governments to their existence were not part of a brief historical anomaly, but the norm, the logical result of a certain rationality. In other words, it could happen again at any time. By the time we reached the seventh year of my father’s slow agony that had followed the course of the Yugoslavian bloodbath, I came to believe that anything was possible. (…) However much I resisted the thought, I understood that events were not informed by our values and desires. All through the Yugoslavian horror I was arguing that each drop of blood spilt would be the last and that each act of wickedness would prompt a severe response. 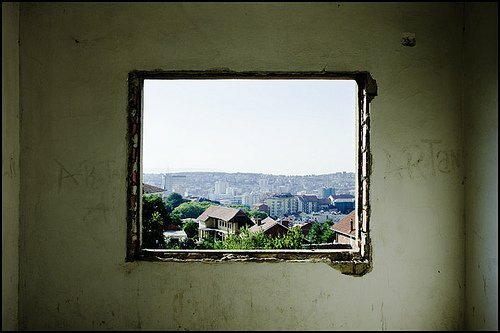 When the people of Bosnia voted overwhelmingly for a pluralist multi-ethnic democracy and Karadžić’s troops massacred the voters, when they bombed the crowded marketplace at Sarajevo, when they starved, murdered and tortured several thousands of prisoners behind barbed wire, when the barely armed peacekeeping troops allowed the men of Srebrenica to be led off and then piled into mass graves day after day, once I had overcome the shock, I was continually hoping that now at last the world would be sufficiently shaken to recover its conscience and intervene immediately to stop the killing. But the world’s conscience did not wake, or in any case it arrived posthumously, once the corpses were buried deep underground; and one weak, overdue flicker only served to generate some guilt. Flickr/lucas deve. Some rights reserved. By the summer of 1992, when snipers were competing to see how many pram-pushing mothers, shaky old grandfathers or children running to fetch water they could hit from their positions in the hills surrounding Sarajevo, my father could barely move for the pain caused by the swelling in his head. By the time they ushered him from his university office without even a handshake to say goodbye, armed gangs were spreading fear all over Croatia and Bosnia. By the summer of 1999, when that Balkan Macbeth Slobodan Milošević, scenting defeat and full of bloodlust, decided to clear out Kosovo as though it were a gym that needed repainting, and to murder, burn or blow up anybody who got in his way, my father began to list to the left. He kept bumping into the furniture and one day he followed my mother to the bank veering from one parked car to another. He was determined that he, gallant knight that he was, must save my mother from the bandits of the market economy whose latest trick was to rob and kill old people tottering to collect their pensions. The last passionate political arguments in the hall of the flat in Németvölgyi Road took place in the early spring of 1992, when my father tried to convince me that Milošević, the last bastion of the principle of socialist collective ownership, was facing an Islamic fundamentalist in the Bosnian leader Alija Izetbegović. While occasionally admitting his historical achievements, my father could never forgive Comrade Tito for becoming a running dog of imperialism and allowing the system that millions (including himself) had staked their lives on to collapse from within. In 1989, when Party official Milošević came to power in the by-then somewhat looser Yugoslavian Federation, my father recovered the hope that this hardboiled apparatchik would save the sinking ship of socialism. It had been years since we had conducted any kind of political conversation but this storm of terrible events in a neighbouring country wrought such elemental passions in both of us that we were screaming at each other, red-faced, between the crowded bookshelves of the hall, just like in the good old days. ‘Mass murderer! Manipulator! I don’t care what Izetbegović wrote fifteen years ago! What do you mean socialism? What do you mean fundamentalism? Excuses!!! He is a power-obsessed psychopath!’ I was yelling, quite beside myself. Poor Hegel, Gegel and Bebel (on the bookshelf) were in a tizzy. They didn’t know whether to laugh or be seriously scared. They had forgotten that we used to have such screaming matches regularly. When we had done with the steam and smoke we went unwillingly to put on our jackets because my mother chased us out of the flat and told us to go for a good walk. Mother was, of course, right as usual. By the time we reached the corner of Pagony Street we had calmed down. ‘Lucky that Danilo Kiš did not live to see this,’ I said by way of reconciliation. My father hummed in agreement. Not that he was exactly a fan of Kiš, but I did once shove a short story by Kiš under his nose, the one involving the murder of Rosa Luxemburg. He had hummed in exactly the same way then. I left the book for him in the hope that he would read the rest. When I asked for it back some weeks later, it turned out that it had vanished into the vortex of his study and I was obliged to buy a new copy. In the early autumn of 1993 I received a call from an acquaintance to say that Zdravko was in Geneva and, if I had time, I should join them both for dinner. Zdravko taught history at the university in Sarajevo and had been allowed out of the besieged city to take part in an international conference. Two years before, when we met at a similar conference in Prague, he had been a handsome young man who spoke enthusiastically about the possibility of a global civil society. This time a grey-haired old man with burned-out eyes faced me across the table. He had the same grey look as all those other men I had seen in documentary films about Bosnia. It was as if, irrespective of their ages, the brutal annihilation of their land had hung the sign of death over them. Zdravko didn’t say much, and said practically nothing about the city. Screwing the thin white napkins into paper balls, I leaned against the cool tiles that covered the wall of the kebab restaurant where we were eating and listened to the conversation without saying anything myself. I was ashamed to be living in this calm and comfortable city, just two hours away from the massacre that was dealing a last blow to Europe, while also despairing about my father. Of course, my heart was heavy on account of Bosnia as well, but now, suddenly face to face with this prematurely aged young man, I thought it was wrong to feel such despair at my father’s single, not untimely, approaching natural death. The devastation leisurely working its way through my father’s cells was, after all, a natural and dignified form of last rite, something a man can feel a part of. Suddenly the whole thing seemed dwarfed by the devastation wrought beyond my country’s southern borders. My father’s approaching one-off death had cast a shadow over my life as though it were something unique, threatening the natural order of the world. Our neighbors’ reality involved the possibility of death at any moment, a possibility that people had had to learn to live with, much as they had learned to live with low water pressure or constantly late buses. Meaningless mass destruction was a legitimate part of our apparently orderly lives, something we could indeed live with. The fact that we could do so quite calmly raised doubts about the credibility of either reality. Right in the middle of the Bosnian war, for some mysterious reason that I can’t recall, I landed at the old airfield of Budapest. I sat down on the steps to the arrivals hall and waited for whoever was coming to fetch me. In the empty airport car park stood an enormous, sparkling clean bus with the word Yugoslavia proudly displayed on its side. It was a warm, late autumn day and the sun was blinding but its rays no longer warmed me. I sat in the deserted square and felt an odd calm. It was as if time had stopped and I felt the kind of unexpected happiness that I had felt in my innocent youth. Perhaps it was all a bad dream? Perhaps Yugoslavia was not falling to pieces? Perhaps the dead weren’t really dead? Perhaps my father was in good health? Perhaps it was possible to get back to a point where everything was all right? ‘Seriously, darling, how far back do you want to go?’ murmured the voice of the socialist realist co-tenant in my head. But I paid no attention. I was sunning myself on the sparkling wings of illusion. According to the calendar, it was spring when I touched down in Pristina, at an airfield that looked more like an un-ploughed field than a runway, then fought my way through the ring of grim-faced men waiting silently and impatiently at the exit. There was no trace of spring in the fields. It was as if nature had not yet had time to recover from the violence of two years before. The evidence of war was apparent everywhere: on bitter faces, in smashed windowpanes, on ripped-up pavements and walls blackened by smoke. Despite the order established, with great difficulty, by international forces, the embers of violence were still glowing. Late at night, alone in the bullet-riddled hotel towering over the town, whose upper floors were in a state of utter disrepair, I listened to the noises of the night in case I could catch the ‘sweet silence’ Ivo Andrić once wrote about. But the icy wind whistling through the window brought only shouts, the drumming of feet and the unsettling sound of speeding cars. There was no crackle of gunfire, only the threat of it at any moment. The dawn before we left Kosovo, the minibus of some British organisation rolled up at the hotel entrance because there were no taxis, or at least none willing to carry passengers to the border. My colleagues sat me next to the driver, the rest squeezed in the back with the luggage. I did what my father would have done and started asking questions. The young driver had been a schoolteacher who had been sacked soon after Milošević had taken office and who had later continued teaching in the parallel educational network that tried to operate in private flats. Along with other family survivors of the massacre in Kosovo, he had made his way on foot to the Albanian border. ‘Look, this is me.’ He fished in his back pocket. I watched frightened as the bus juddered over potholes, but didn’t have the nerve to ask him to hang on to the wheel if he didn’t mind. The carefully folded German language newspaper he produced from his wallet showed a Reuters photograph. In it a never-ending queue of people with bundles and suitcases were making their way up a hill top. ‘That’s me,’ said the driver as, by great good fortune, he finally managed to grab the wheel with one hand while using the other to point to a weary-faced young man with what looked like an enormous backpack, his arm around a little girl carrying a doll. I stared in silence at the picture shaking in front of me. I didn’t dare ask if there were any other men left in his family that could carry the child. He was the only young man among the group climbing the hill. ‘Who is the little girl?’ I asked him. “Scum” means the Serbs. She keeps shouting “Fire” because every time she sees a uniform it reminds her of our burning house. She doesn’t know the difference yet,’ he added when he saw I hadn’t really understood. It grew quiet, a quiet disturbed only by the squeaking of the minibus and the bodies being thrown about with the luggage at the back. I cleared my throat. ‘And what do you say to her, then?’ I asked tentatively. ‘But not all Serbs are scum,’ I muttered half to myself. He gave me a quizzical look, then silently turned to face the road again. ‘If a child is brought up to hate, there will never be an end to it,’ I muttered, still more quietly. ‘You saw what we went through,’ he retorted. I noted the wrecked military vehicle at the side of the road, the broken trees, the sacked buildings. My fingers were blenched as I clutched the white plastic handle over the door. I took a deep breath. ‘Look, I am a Jew,’ I said eventually. I was aware that the noise behind me had stopped. ‘Ah,’ he said, and thought a little. ‘In that case you should know better than anyone,’ he almost shouted, turning to me again. As far as time and circumstances allowed, I held a rapidly improvised lecture about those who exploited the concept of national identity in oppressive régimes. When we reached the border, he helped me from my seat and quickly turned away. I followed him. ‘Goodbye,’ I said and extended my hand, aware that I was looking at him rather beseechingly. He shook my hand as if he didn’t want to and went to help unload the luggage, then drove off without looking at me. Although it was early morning, I felt exhausted as if I had been breaking stones all day. We walked across the no-man’s-land between Kosovo and what was then still the Federal Republic of Yugoslavia, as inconspicuously as we could because at any moment someone might take a shot at us. Once there, we waited for a couple of hours before getting on another minibus. A dour-looking silent man sat next to the driver now. I watched in silence as the trees at the edge of the road rushed by, saw the big Serbian flags planted by the fresh graves and gazed at the tractors puffing at the edges of the road, while to our left glittering Mercedes saloon cars cruised by. I felt confused walking around Belgrade. I couldn’t decide whether the well-dressed, loud young men in the street were protesting for or against the current régime, or whether they were just youths messing about; I couldn’t understand why the national flag was displayed from the windows of cars taking people to weddings or why anyone would cover the pedestals of statues with graffiti saying: We love you Slobo, despite the fact that Slobo had spent the last six months in a well-heated cell in The Hague and no one needed to fear him any longer. If there was still killing or if those who had brought it about were still at the peak of their power, this sense of solidarity and collective amnesia might have been explicable. But with Milošević gone, what was the point? Is it true that you become an unwilling accomplice of a crime committed on your behalf? In all the bitter arguments I had with the inhabitants of the country still known as Yugoslavia, it seemed as if the map drawn up in Karađorđevo between Milošević and the President of Croatia, Franjo Tuđman, showing the dividing up of Bosnia and what it entailed in terms of those hundreds of thousands of people who had been murdered, raped or exiled from their homes, was a secret known to me alone. Everyone I spoke to, from the taxi driver to the ministerial representative, knew only about the havoc caused by NATO ’s bombings, about the hardship of the NATO embargo, and about Serbian refugees spending the winter freezing in wooden barracks. All this was true but, I insisted, we should start from the speech made by Milošević in 1987 at Kosovo Polje, the speech that led directly to Karađorđevo, the destruction of Bosnia and the cleansing of Kosovo in 1999. There you go again with that same old scrap of paper, they sighed, rolling their eyes. What damage can a scrap of paper do to solid walls and centuries-old bridges, and to flesh-and-blood people? Only now did I finally understand why my father ranted at me in the hall of the Németvölgyi Road flat claiming that the ‘fundamentalist’ Izetbegović was set to loose a jihad on the world. It was the peculiar speciality of the Yugoslav war (or any war?) to twist historical facts in order to create a mood of terror. Having read Misha Glenny, Malcolm Noel and other historians of that war, it became clear to me how these deceptions worked, but those affected by them apparently had other sources of information. There was a vast chasm between reality and its representations, but it was pointless me saying that those on the other side were prey to misconceptions and false myths. Misconceptions and false myths formed reality as well. Those people were my own frightening reflection. They were, after all, subject to the same desire for myth and wish-fulfillment as I was, or at least the part of me that was constantly trying to escape the grip of the socialist realist tenant. What was it my mother used to say? ‘Being determines consciousness.’ Or was it the other way round? When do ideals become false consciousnesses? At what point does the pursuit of myth become murder? I was relieved to climb the steps to the plane. Up there, riding the highways of the sky, I could admire the crimson light above the layers of cloud and try to imagine what I would tell my father. ‘You see what happens when you refuse to face the facts? When you try to sweep the truth, the past, and the sense of responsibility under the carpet?’ I muttered to myself grumpily before I remembered he had been dead for years."